Today, we, the leaders of China and ASEAN countries are meeting here in the beautiful city of Nanning to celebrate the 15th anniversary of the China-ASEAN dialogue relations. First of all, I would like to extend, on behalf of the Chinese Government, a very warm welcome to you. Fifteen years ago, the opening of dialogue process between China and ASEAN turned a new page in relations between the two sides. Looking back at the past 15 years, we are glad to see that China-ASEAN relations have come a long way from removal of misgivings to commencement of dialogue to enhancement of mutual trust and to the final establishment of strategic partnership. Thanks to our joint efforts, our bilateral relations have made progress unseen in history. Relations between China and ASEAN have never been as good as they are today. In the political field, mutual trust is growing. China was the first ASEAN dialogue partner to join the Treaty of Amity and Cooperation in Southeast Asia and to establish strategic partnership for peace and prosperity with ASEAN. The two sides jointly issued the Declaration on the Conduct of Parties in the South China Sea. Economically, we are moving towards greater integration. In just 15 years, our trade grew by 15 times, from less than eight billion U.S. dollars in 1991 to over 130 billion U.S. dollars in 2005. By the end of last year, ASEAN countries had set up close to30,000 investment projects in China, with a total investment of about 40 billion U.S. dollars. China's investment in ASEAN countries has also grown. We were the first to start the process of establishing a free trade area and have signed the Framework Agreement on Comprehensive Economic Cooperation between China and ASEAN. We enjoy extensive cooperation in priority areas. We have decided to advance bilateral cooperation in all areas in a comprehensive way for the period of 2005 to 2010 and have identified ten priority areas, i.e. agriculture, information industry, human resources development, mutual investment, Mekong River Basin development, transport, energy, culture, tourism and public health. Effective mechanisms have been set up to carry out such cooperation. All the ten ASEAN countries are now approved destinations for Chinese tourists. In 2005 alone, there were over 6.5 million visits between the two sides. We extend mutual support in addressing issues of public security. When the Asian financial crisis and major emergencies or natural disasters occurred, such as SARS, the avian influenza and the Indian Ocean tsunami, we stood side by side, helped each other and overcame the difficulties. We maintain close coordination in upholding stability and promoting cooperation in our region. China and ASEAN are both committed to a peaceful and stable East Asia. The two sides have worked together to advance the 10 + 1, 10 + 3 and East Asia cooperation and coordinated positions in the Asia-Europe cooperation process. China consistently supports ASEAN's leading role in regional affairs and regional cooperation. China-ASEAN friendship and cooperation have contributed to economic and social progress in our respective countries and made life better for our peoples. Moreover, our cooperation has facilitated regional integration, raised the competitiveness and international profile of our region and promoted peace and prosperity in Asia. 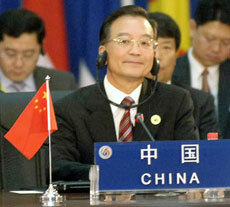 China-ASEAN relations are a fine example of friendly exchanges between countries in this region. They have brought real benefits to the peoples of China and ASEAN countries and made important contribution to peace, stability and prosperity in Asia and the world at large. First, peaceful development is the prerequisite for the growth of China-ASEAN relations. We both firmly pursue a policy of good neighborliness and friendship, see each other as cooperative partners and take other's development as an opportunity, not a threat. We are both committed to peace and stability and we both work for prosperity and well being of our peoples. That is why our relations have become a model of harmony and common development among countries. Second, equality and mutual trust are the foundation of China-ASEAN relations. We respect and treat each other as equals and endeavor to develop consensus by seeking common grounds while putting aside differences. With the overall interests and the strategic importance of our relations in mind, we have addressed each other's concerns with sensitivity and handled issues in bilateral relations appropriately. This has enabled our relations to stand the test of volatile changes in the international environment and move towards maturity. Third, win-win cooperation is the goal for China-ASEAN relations. Basing ourselves on our respective national conditions and long-term development needs, we have enjoyed mutual understanding, support and help in our joint effort to meet the challenges posed by economic globalization as well as traditional and non-traditional security threats. We have expanded exchanges and coordination and broadened our common interests. Indeed, we have embarked upon a new path of promoting mutual benefit and win-win cooperation. Fourth, people's support is the driving force behind China-ASEAN relations. Our cooperation helps reduce poverty, narrow development gap, speed up growth and deliver a better life for our peoples. We have endeavored to deepen mutual understanding and friendship among our peoples, thus creating enormous popular support for China-ASEAN friendship, and this is the inexhaustible source of strength for growing our bilateral ties.